INDIA: Competitive tendering and low wind speeds are driving the push to tall towers and long blades in India. Suzlon is now testing its latest S120 2.1MW model on a new 140-metre hybrid tower. The 20-metre concrete base and foundation for the 120-metre tubular steel tower, supporting a turbine with 59-metre rotor blades, pushes the tip height of this new Suzlon combination to a fraction under 200 metres. The Indian manufacturer has reached hub heights of 140 metres before, through its hybrid lattice tubular towers, but this marks a new high for its hybrid concrete tubular (HCT) design. 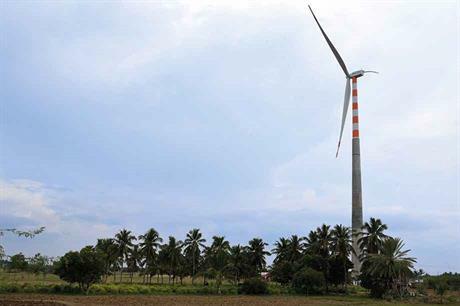 The turbine was installed at the Tirunelveli wind farm in Tamil Nadu and commissioned in October. Earlier this year, Suzlon commissioned the biggest turbine made in India — the S128 2.6MW.